Sights, Events and Activities Info. 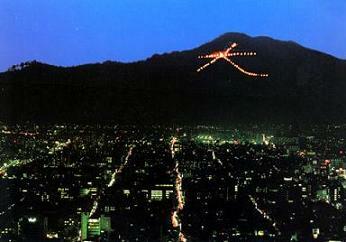 in Kyoto: Let's go see Daimonji Fires together! We are going to see Daimonji Ritual Fires together!!! The Daimonji Gozan Okuri-bi is one of the four major traditional seasonal events in Kyoto. The fires are set on five mountains in the city and each represents Buddhist symbol, which is used as a way of guiding the spirits of the dead back to the Buddhist Pure Land; Daimonji fire setting starts at 8pm. We meet at J-Hoppers Lobby and leave at 7pm!